A floral pair, a black pair, a navy striped pair and this pretty pair. 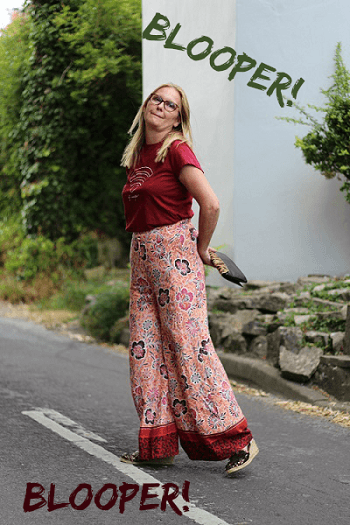 Four pairs of palazzo pants currently reside in my wardrobe. Want to know why? 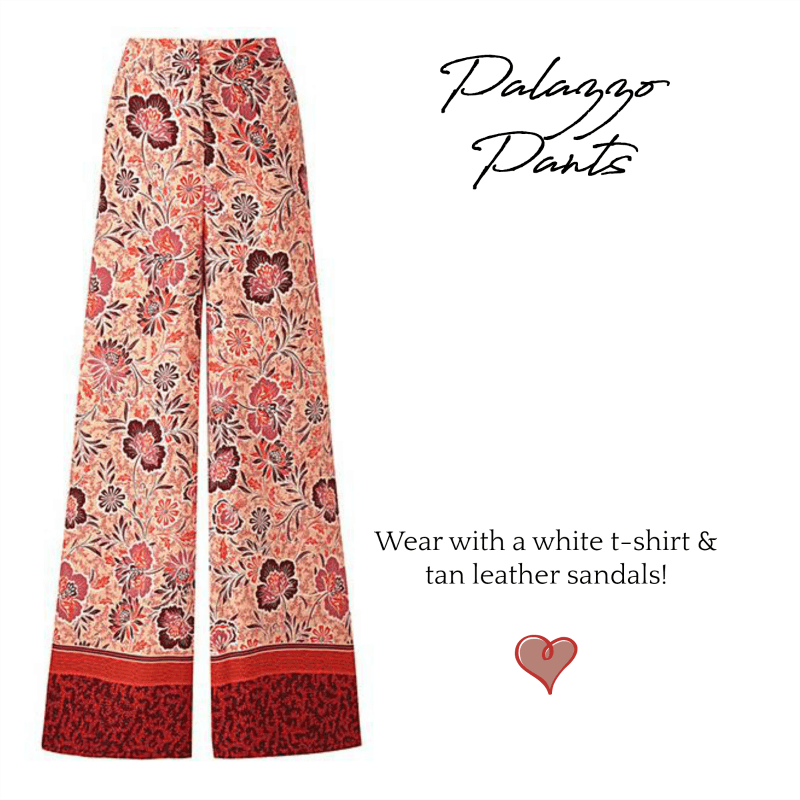 because they are loose and comfy, casual but elegant and so very cool to wear in this heatwave thats why. Not to mention you can wear them with a t-shirt, tunic or a blouse, I think they look lovely with everything. 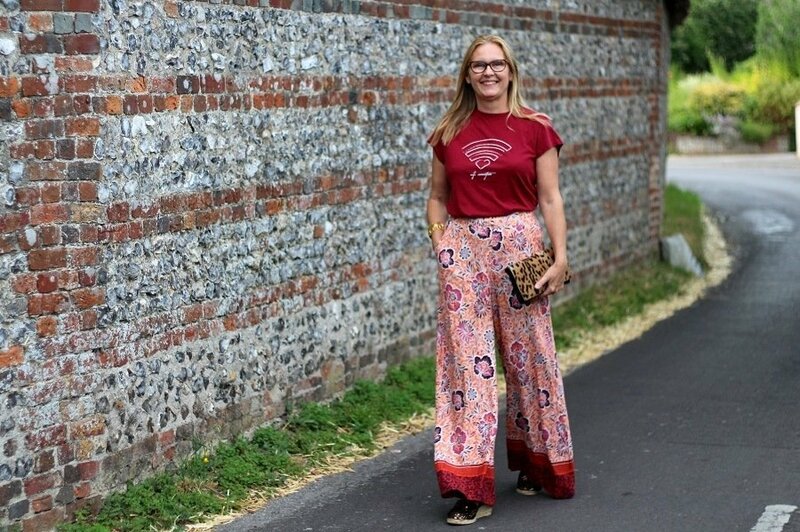 Four pairs of palazzo pants currently reside in my wardrobe. I too, love a good jumpsuit, but the toilet situation can be ‘difficult’ when you are out and about! A black pair should part of every woman’s wardrobe. A true staple, a work horse of a garment. Casual with a t-shirt and flat sandals. Perfect for the evening with a small heel and a pretty top. Packing for a holiday, get a pair of these! Next do a good range for tall and petite people too. 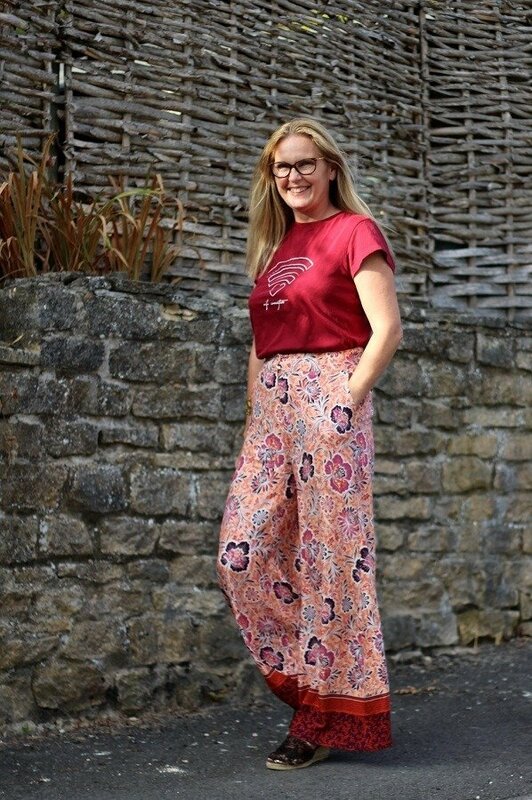 In summer Palazzo pants are easier and far more comfortable to wear than jeans or even dare I say it a jumpsuit. I too, love a good jumpsuit, but the toilet situation can be ‘difficult’ when you are out and about! I’m sure you know what I mean. The Bag was a gift from a Jaeger press event. Its beautiful, you will be seeing a lot of this in the Autumn! Everything else is old, my t-shirt was from Mango, the sequined espadrilles are so old I can’t even remember where I got them from. The Chanel bracelet was from the 80’s ! Soft floaty woven fabric in a great border print design. Zip and button front fastening. Superwide leg shape. Regular – to fit inside leg 29in/74cm. They are comfy true to size, have an elasticated back and two buttons above the zip AND pockets, I love them! Yep there is always one… promise me you won’t laugh? I have no idea what I was doing…that face ! How has your week been so far? We are slowly drifting into ‘summer mode’ chilling with late nights and late mornings. Mon, 2nd: Wearing A Pink Dress In a Field It Must Be Summer! These pretty trousers were gifted to me from J D Williams. A brand I love and am proud to work with. Next Post Next Christmas House, A/W18 Fashion Preview & Talk. Ha ha, I have more of those then photos that make it to the blog! Can you believe that I have none palazo pants. Don’t know why not, they look fabulous! Love the colours too! I can believe it! I love the bloopers! Thank you laurie, they are elegant too I agree! Love the pattern mix and,of course, that leopard clutch ???? BAAAAG envy! Sarah you are so lucky to be tall! Top shop do a gorgeous edgy range for tall gals…check them out online?